There is no end to the great ingredients that can be found on your doorstep. Whether you’re looking for a key ingredient, or something flavourful to create your own cordial or vinegar, foraged food could hold the answer. Foraged food is fresher, more unusual, more diverse and tastier than produce you might find on the shelves of your local supermarket. Our Development Chef, Euan Peach, has put together a delicious three course menu that shows off the beauty of foraged ingredients. This is a common plant which can be found everywhere from the countryside to the city, frequently peeking through splits in pavements. It has crinkly, kidney shaped green leaves when young, which become more pointy with age. These leaves smell of garlic if lightly rubbed or crushed. Its leaves are perfect in sandwiches and when finely chopped and mixed with a little olive oil, they make a refreshing and delicate salad dressing. The flowers pack a bit of a punch but are also delicious in salads. • To start, line a sieve with two layers of muslin cloth and pour the yoghurt into it. Allow the whey to drip out, resulting in a thick labneh. This will take approximately five hours. It can also be left to hang in the fridge overnight. 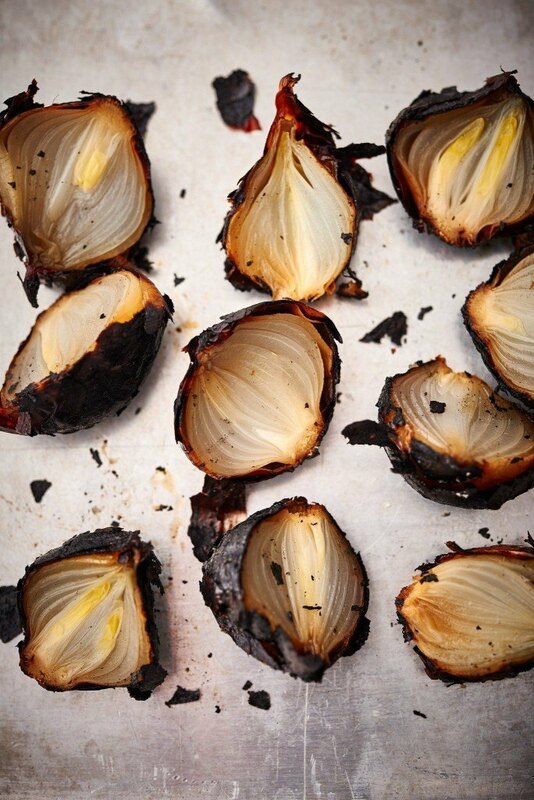 • Place the onions in their skins on the barbecue and cook until the outside is completely black and a skewer will easily go through it. At this stage, place the onions into a plastic tub with a lid to allow them to steam until they reach room temperature. • In a food processor, add the jack, rapeseed oil, lemon juice, cheddar and hazelnuts. Pulse the mix a few times, leaving it as quite a coarse mix. • Slice the onions in half and scoop the middle out using a dessert spoon. Spoon some of the yoghurt on top, followed by the chickweed, then dress everything with jack pesto. Wild garlic is the perfect all-rounder. Versatile and delicious, it can be found across most of the UK throughout the year. It tastes just like regular garlic but has a milder flavour than its cultivated cousin. Use the leaves to create a beautiful wild garlic pesto, a simple addition to your salad, or finely chop them and add to butter. The flowers are a little sweeter than the leaves, with a pepper kick, and are fantastic to add as garnishes to salads, lamb and pasta. • Start by blending 500g of the wild garlic with the black pepper and oil to a paste. • Place the lamb shoulder in a tray and rub it all over with thegarlic paste and leave in the fridge for 24 hours. • The next day, get a large frying pan hot with some oil in it and begin browning the lamb all over, seasoning with salt as you go. Mix the salt and egg whites in a large bowl until the mix sticks together but not to your hands. • Taking a baking tray, add a layer of the salt mix about one inch-deep.Using the remaining garlic leaves, create a ‘blanket’ over the salt mix, then roll the lamb up on itself and place on top of the garlic. Use the last of the wild garlic to completely cover the lamb shoulder. Finally completely cover the lamb with the remaining salt mix, checking for air pockets and holes. Make sure its completely covered. • Place in the oven at 260ºc for one hour, then turn down to 160ºc for 2½ hours. • Leave to sit for at least an hour before breaking open the salt. Elderflowers are one of the most versatile ingredients you can forage. You can eat them raw, cook them, dry them and use them as powder. You can also create cordials and vinegars, or make ice creams and cakes; the uses for these delicate blooms are endless. Elder bushes are usually covered in sweet-smelling flowers by the end of June and are quickly followed by berries between August and October. Elderberries can be put to many of the same uses as the flowers, but the leaves and stems are poisonous. Elder is widespread and abundant in hedgerows, woods and along roadsides. • In a pan, mix the whole milk, double cream, sugar and the elderflower and bring to a boil. Then cling film the pan and leave to infuse for 15 minutes. • Meanwhile, soak the gelatine in cold water until bloomed. • Strain off the cream infusion through a fine sieve, then place 200g of the mix into a small pan along with the soaked gelatine and warm through until the gelatine has completely dissolved. At this stage, pour the gelatine mix back into the infusion, add the lemon juice, then set in desired moulds. • Slice the strawberries in half, keeping the stalk on as this adds to the flavour. • Place all ingredients into a pan and bring to a boil. Remove any scum and allow to cool at room temperature, then pour through a fine sieve and reserve in the fridge. • In a food processor, blend all ingredients until it forms large pieces. 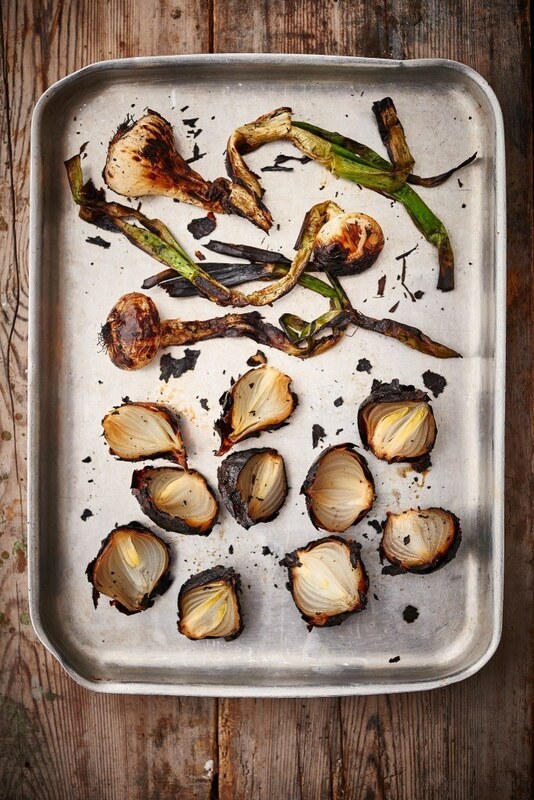 • Place on a baking tray lined with greaseproof paper, and cook at 160ºc for 35-45 mins or until golden brown all the way through, then leave to cool at room temperature. • Demould the panna cotta into the desired bowl, spoon a couple of tablespoons of vinegar over it then crumble some biscuit over the top and drizzle with olive oil.